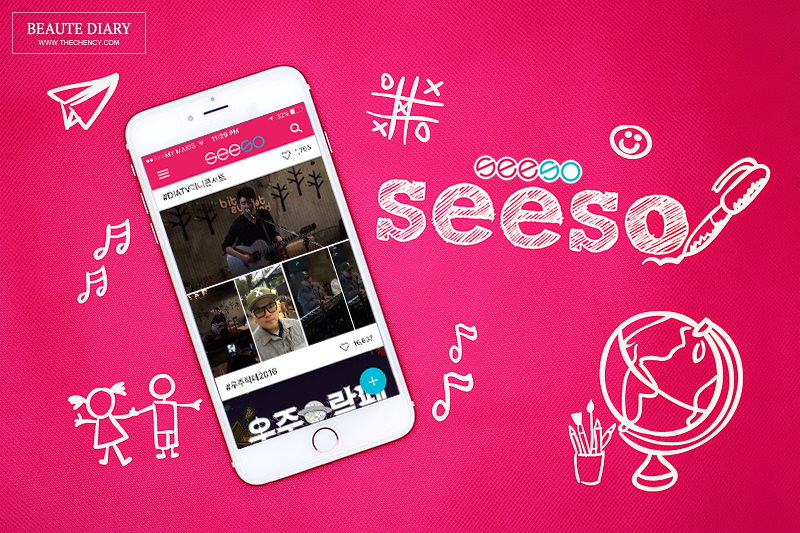 Just simple information about Seeso App, is a Fancam for users who love to watch and share popular gigs curated by hashtag and location. For me, this app is the combination of Insta's Video + Snapchat which makes this app even more user-friendly and easy to access. The platform is simple and if you like a video, tap anywhere on the screen to give support 'hearts' to the video. Seeso is the words combination of 'See' and 'Saw' which is the bridge between the event-goers and event-misser by sharing videos onto the app. It actually mainly focuses on music, dance, arts and entertainment. Videos are grouped together by hashtag and location which lets you feel like you're there at gigs. You can easily track the videos by just using hashtags. Also, you can check and upload videos of the same concert or any occasions by grouping then together and curated by hashtags. I like grouping a video by using hashtags like #streetperformance, #liveband, etc... It's makes everything looking polish at your own homepage. Like other social media apps, Seeso can be recorded with 18 seconds vertically. You can easily capture your favorite musician's performance by using 'Continous Mode' and 'Press & Hold Mode'. In other option which is my favorite as well, pre-record first and then upload to Seeso and trim into 18 seconds long video. The rest video will continue upload as a second video. Seeso giving much freedom love by just tapping anywhere in the video you're watching. You can also give unlimited hearts to support the video you're like. Videos with most affection will be placed at the top of the popular list as GIF highlights. Sharing is caring! Sometime I love to share to my other social media platform as well like Facebook. Twitter, Google+ and more.... to get in touch with my friends. This app is really user-friendly. To upload, you can either record the event live or pre-record then upload by just clicking '+' button at bottom right of the screen. Then, just apply your desired hashtag, location, and descriptions. As simple as abc. When you feel like a video is bad and want to delete it, just find it at the bottom of description box in the video. Overall, you will get used to it after within three times playing. By the way, Seeso is available to download at Google play and App Store. 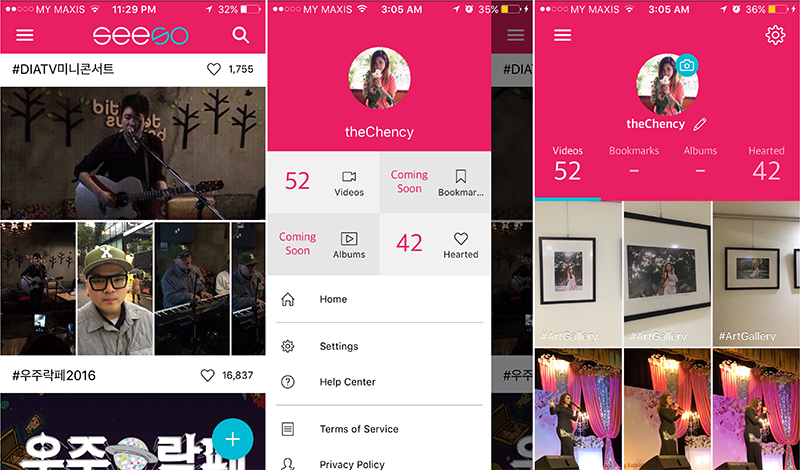 Seeso is a Fancam for music lovers To watch and share popular gigs curated by hashtag and locations. This platform is so easy to understand and manage but you have to make sure that have enough speed of data/internet to upload and watch the videos, or else you might experiencing kinda lagging running the app. So far, I only experience once or twice so I consider this app is pretty much stable right now. This app is from Korea so you can see many awesome events happening right there but I'm glad there's more Malaysian into this app lately. In conclusion, I am having fun sharing what happening around me by recording video onto this app and giving tons of heart to the video I liked. For more information about SeeSo App, please visit their Website and Facebook Page. Wow this seems like a cool app. I wanna download it oo. Sounds like an amazing application. It's too bad that I am so busy lately that I don't even have the luxury to touch my phone. Nowadays, so many social media app appear in our life...we can easily share our life and experience to more ppl!! Saw my friend using this app too, looks fun but i currently have too many apps on my phone liao! I like this app, whenever I go to concerts, live music or dance I will upload it there to share with other. This app look fun. Can this app allow us to follow our favorite band? I see it have bookmark function too.